Organic. Great taste 2014. 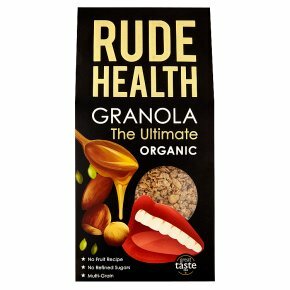 The completely mouth-boggling granola. No fruit recipe. No refined sugars. Multi-grain. Clean ingredients. No artificial anythings. High fibre. No added salt. Non-GM. Vegetarian Society approved. Kosher - KLBD.There's so much going on in this granola, it's hard to know where to start. It's multigrain, so it's got oats like a normal granola, but we also add some spelt and barley for a more complex, grown-up flavour. The subtle sweetness comes from a blend of honey and date syrup. That sets off the cheerfully crunchy seeds, toasted nuts and puffed amaranth. How we like it Granola is lucky to make it into the bowl at all, at our place. We love nomming handfuls straight from the pack as a healthy snack. If you have the control to get The Ultimate Granola to a bowl, sprinkle it on thick Greek yoghurt and top with fresh berries or sliced banana.